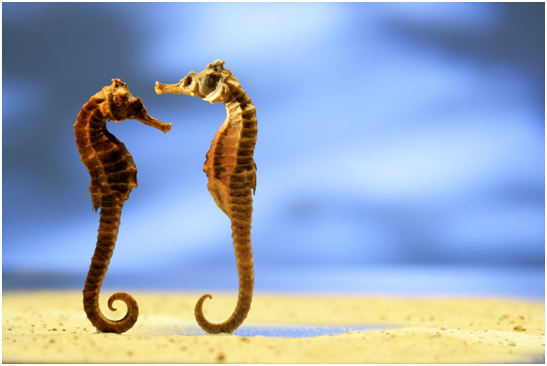 First, you should note that seahorses have prehensile tails, which means that they use their tail for grasping or holding objects rather than for swimming. This makes them pretty unique in the fish world, where it is only seahorses and pipefishes that have these. 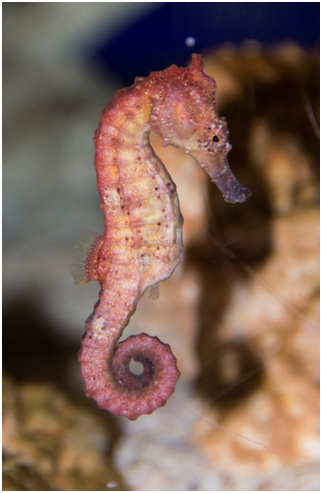 The square structure of the seahorse’s tail isn’t seen anywhere else, though, and this is what makes it unique across the whole animal kingdom. For years people were puzzled as to why the tails were square when all other prehensile tails were cylindrical. Hypotheses such as improved strength, a better grip and faster return to shape after it was squashed were proposed. Recently these hypotheses were tested in a lab setting to uncover what exactly the reason behind the unusual tail shape is. To test the tails, researchers created computer models of the seahorse tails that would be seen in nature and then 3D printed them to create physical copies. These ‘tails’ were comprised of 144 L-shaped plates combined to create 36 square segments. In the centre of the tail was a vertebral column connected to the segments with ‘connective tissue’, just like in a real seahorse tail. A second tail was also made in this way but with a cylindrical structure, so that researchers could see how the two would compare. One of the tests applied to the two tails was one that mimicked a predator attacking the seahorse. The researchers used crushing and distorting pressures on the tails to see how they stood up. Whereas the cylindrical tail became damaged fairly easy, the plates in the square prism tail were able to slide past each other to deflect any damage away from the vertebral column. It took far more pressure to damage the square-prism tail. The square tail also had the elasticity to pop back into shape far more easily after becoming uncoiled. More tests on the tails proved that the square-prism tail had more grip on surfaces they were grabbing too, due to an increased contact area. The cylindrical tail did win in terms of mobility, being able to move more quickly in a wider range of directions to the square prism tail, but this came at the cost of strength and durability. Of course, us smart humans didn’t just stop at figuring out why seahorses have square tails, we also started looking at applications for how these findings could be used in robotics. One proposed application for this square-prism tail would be for laparoscopic surgeries in which a strong but flexible robotic device is required to move around inside bodies, moving organs and bones to aid with the surgery. Another use could be in search-and-rescue where square-prism snake-like robots could be used to navigate through rubble, expanding and contracting an armoured outer shell to get through tight spaces. At Airedale Springs we’re fascinated by all things engineering, whether it’s when we’re designing our compression springs or stories like this. If you are in need of any springs, wire forms or pressings then we can certainly help you out! With our fantastic range of products and services we are capable of making all our clients happy, no matter what the requirements are. If you’d like more information about what we can do for you don’t hesitate to contact us on 01535 643456.